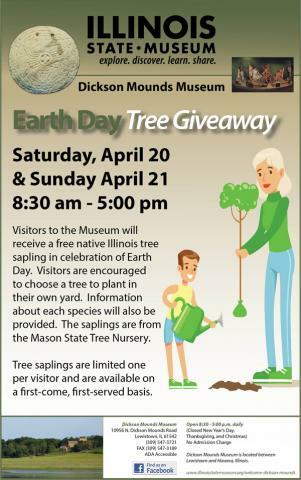 Visitors to the Museum will receive a free native Illinois tree sapling Saturday and Sunday, April 20th and 21st in celebration of Earth Day. Visitors are encouraged to choose a tree to plant in their own yard. Information about each species will also be provided. The saplings are from the Mason State Tree Nursery. Tree saplings are limited one per visitor and are available on a first-come, first-served basis.